Heart rate monitors (HRM’s) are devices that can measure and display your heart rate in real time. HRM’s comprise a watch like receiver and a chest strap. The chest strap is worn next to your skin and has two electrodes which send a signal to the watch. 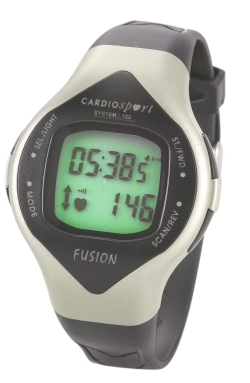 The watch records the information and displays your current heart rate. There are also strapless HRM’s which provide heart rate information on demand when you press the sensors on the unit. When you’re wearing a HRM, you can see very quickly whether you’re exercising at the right level or not. As a result, you can alter the intensity of your cardiovascular session. Thus, you can get the maximum benefit of your workout within the time you have available. There’s an enormous range of HRM’s on the market with varying functionality. You can now get HRM’s that will help with your weight management, running and cycling. Basic devices will show your heart rate in real time and display your average heart rate at the end of your session. At the top of the range, you can download details of your session and view the results on your computer.